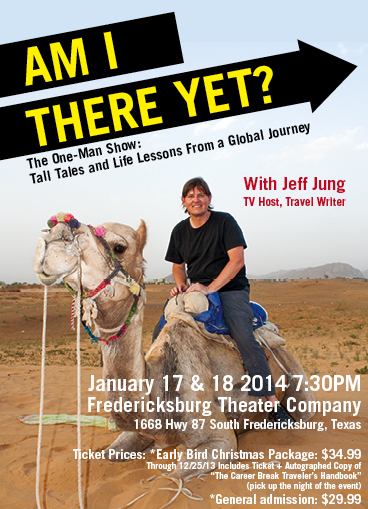 On January 17-18, 2014, Jeff Jung of Career Break Secrets will present: Am I There Yet? Tall Tales and Life Lessons From A Global Journey. Jeff, “The Career Break Travel Guy” returns to his hometown of Fredericksburg, Texas after seven years of living abroad. A corporate wonk turned author, TV host, and producer, Jeff will bring his stories to life and give you a taste of what it’s like to travel the world. Bring a friend and join us for this evening full of entertaining travel stories and life perspectives told with wit, heart and a touch of self-deprecation that will inspire all who attend. The event will be held two nights only, at the Fredericksburg Theater Company in Fredericksburg, the heart of the beautiful and charming Texas Hil Country. An Early Bird Christmas Package is available for $34.99, including a general admission ticket to the event + autographed copy of The Career Break Traveler’s Handbook to be picked up at the event. 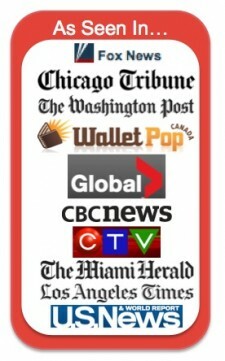 General Admission tickets are $29.99 and books will be available for sale at the event. Tickets can be purchased online via Eventbrite. This entry was posted on Monday, November 4th, 2013 at 7:00 am	and is filed under in-the-news. You can follow any responses to this entry through the RSS 2.0 feed.You can leave a response, or trackback from your own site.